When I’d heard that the flavor theme for April’s #TwelveLoaves challenge was orange, I was a bit worried. You see, I’m more of a savory lover than a sweets lover so it took me awhile to wrap my head around a recipe idea. 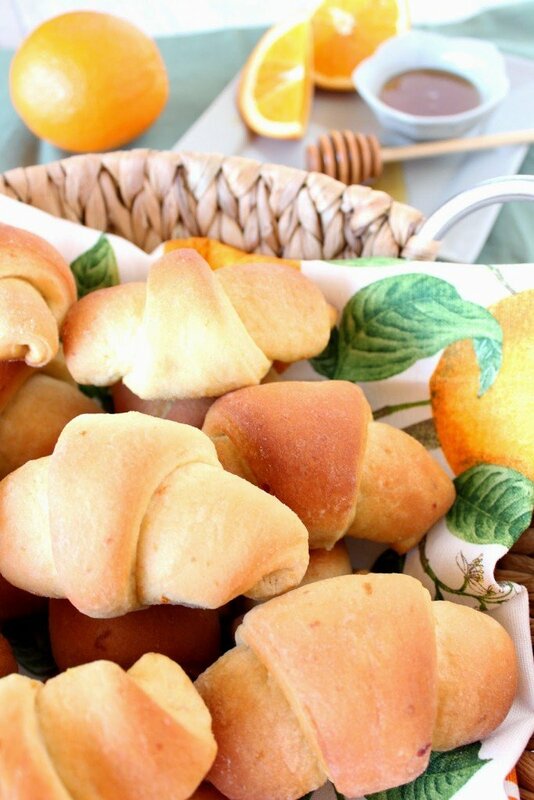 But after I’d decided to try my hand at making my very first homemade crescent rolls, the idea for these Orange Honey Crescent Rolls had me so very excited that I simply could not wait to get baking!!! These warm and yeasty crescent rolls have mild orange flavor, a light sweetness from the honey and the incredible richness that only real butter can give. 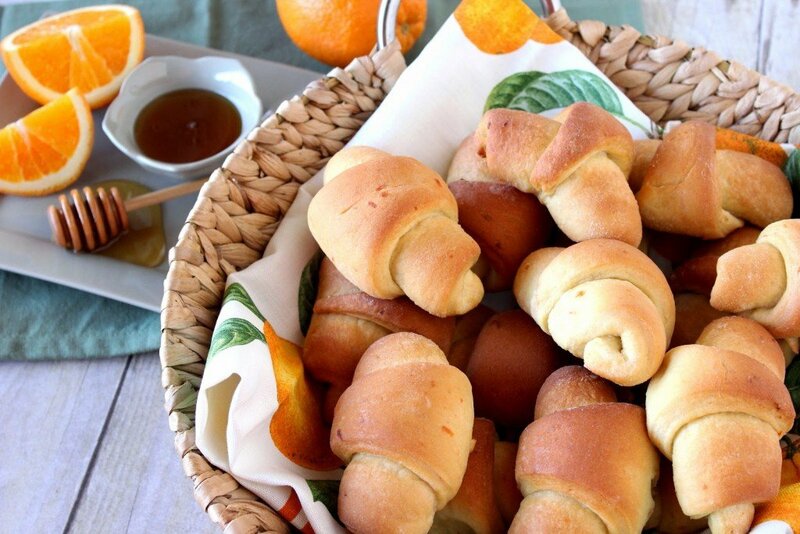 Quite simply, these Orange Honey Crescent Rolls are some of the best rolls I’ve ever tasted, and I’m not just saying that because I made them (and now you can too)! In truth, I was a little intimidated at the idea of making my own homemade crescent rolls, but no longer! These are so super simple to make, and will give you such a tremendous feeling of pride and satisfaction once they’re done and ready to eat…and isn’t that what cooking and baking is all about? You bet! -In a small bowl, dissolve the yeast in the warm water. Stir in the honey and allow the mixture to sit and get foamy (approximately 5 minutes). -Add the yeast mixture into the bowl of a stand mixer (or a large bowl). -Stir in the eggs, orange zest and 1/2 cup softened butter. -Using the dough hook (or wooden spoon) stir in 2 cups of flour, until incorporated. -Stir in the remaining flour and salt, and continue to work (knead) the dough until it’s smooth and elastic. -Cover the bowl with plastic wrap and place the dough in a draft free place to rise until doubled, approximately 1 hour. -Punch the dough down and divide in half. -Working with one half of dough at a time, roll the dough out on a lightly floured surface into an approximate 14″ circle. -Brush the surface of the dough with the melted butter. -Using a knife or pizza wheel, cut the dough circle into approximately 12-15 wedges. -Roll up each wedge, starting with the wide side, and place each roll, point side down on a parchment lined baking sheet. -Gently hand bend each roll to form a slight arch. -Follow the same procedure with the other half of dough. -Allow the rolls to rise again in a warm, draft free place until doubled, about 1 hour. -Bake at 375 degrees for approximately 20 minutes (or until golden brown) and brush the tops with butter when they come out of the oven. There now, that was easy, right??? 3. Have your Twelve Loaves bread that you baked this April, 2014, and posted on your blog by April 30, 2014. #TwelveLoaves is a monthly bread baking party created by Lora from Cake Duchess. #TwelveLoaves runs so smoothly thanks to the help of the lovely Renee from Magnolia Days and Heather from girlichef. Well, if those aren't the prettiest crescent rolls I've ever seen! Just lovely, Reneé! You do make them sound so easy so I'm pinning on my Recipes to Try board. 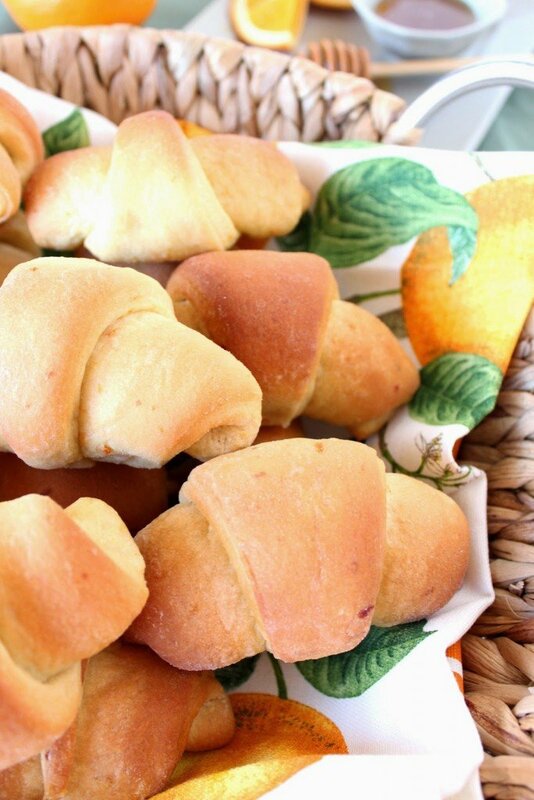 Homemade crescent rolls – my husband would probably eat the whole batch and be looking for more. This is a keeper recipe for sure. Easy enough for ME! Nice baking with you this month for #TwelveLoaves! What a beautiful color your rolls have got! perfect shape and they have proved really well. orange honey crescent rolls?!!! love these! they are perfect! my kids would gobble these up within minutes! 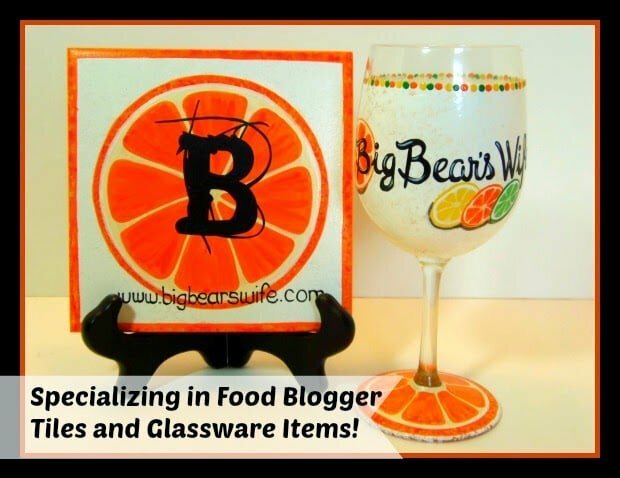 Those are so cute, and the colorful dish towel is perfect! I need to definitely try these! One of my daughters is the biggest fan of crescent rolls, so I can't wait to surprise her by making some that are homemade. They look delicious! 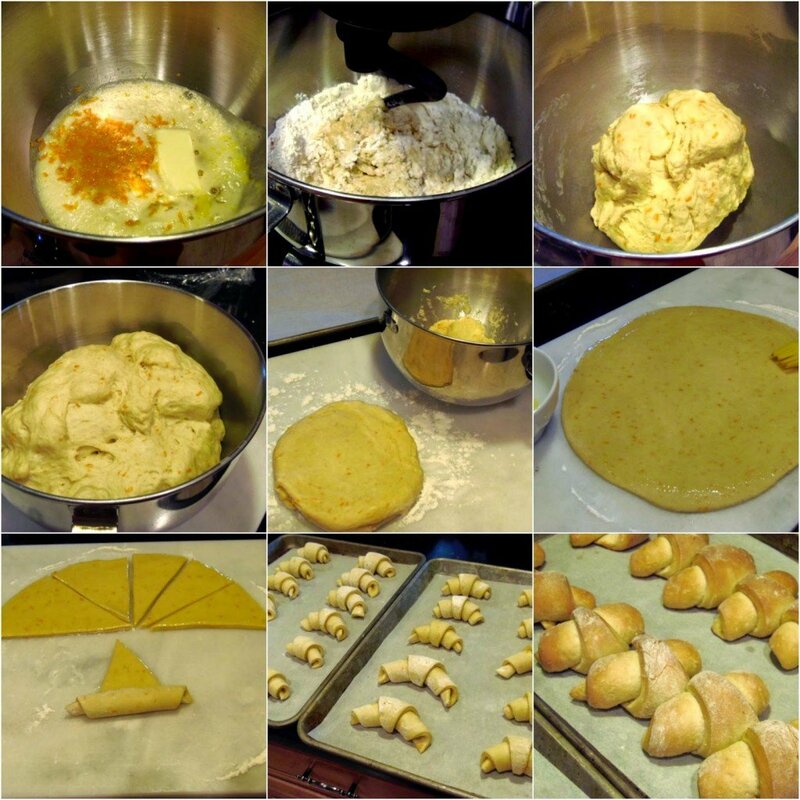 Crescent rolls are one of my favorites and I've never made them. Yours are perfectly formed and so nicely done. Beautiful! First I love the name, second, those will be perfect in my diner table today.